Could Lightning Strike A Second Time For UK After 41 Years? 41 years ago, I was witness to the best UK football team of my time as a member of the Big Blue Nation. That team was led by Derrick Ramsey on offense and Art Still on defense. For those current members of the Big Blue Nation who missed that season, invest about 15 minutes of your day and watch this video. I promise you will not be disappointed. 10-1, Ranked #6 in the poll and not eligible for a bowl due to NCAA sanctions imposed a year earlier. That winter, 1977-78, was one of the best basketball seasons of my life, ending with the Cats hanging the banner for #5. The 1977 football Cats got stronger with each passing week. After stumbling and giving away the magical opportunity of an undefeated season in week 2 at Baylor, the Cats traveled to Happy Valley and beat Papa Joe Paterno's perennial football power Penn State. Upon returning home, I witnessed the Cats destroy a good Mississippi State team in Commonwealth on a Saturday night. All the talk about the Cats pointed to back to back road games at LSU and Georgia in mid to late October. After the Cats handed these SEC powers losses on their home turf, the rest of the football world took serious notice. There are serious similarities between 1977 and 2018. This football team is not just the real deal, but they are surging, and we have not seen their best yet. In addition, the basketball Cats will open their season in about 5 weeks favored to bring home the hardware for the 9 th time in April. Could it be that the Big Blue Nation will be blessed with a top 10 football team in the same school year as a basketball national championship? Stay tuned for that answer in a few more months, but the basic ingredients all appear as of September 23, 2018. I am so happy for these players, and especially for Mark Stoops. People talk about Benny, and rightfully so, but this defense is getting better by the day.  UK continues to rise, now to over 2.5 ppp ANE.  South Carolina is at about 2.25 ppp, and with the HCA for UK, the Cats should be favored over USC by about 6 points.  Texas A&M on the road will be a real tough game, but given the way this team has performed in “big games” to date, don't be surprised by another big road win.  Georgia at about 3.5 ppp is the strongest opponent left on the schedule, and based on the data today, the Cats will be an underdog to the DAWGS, say about 8 points.  The projection has risen to 10-2, 6-2, with a trip to Atlanta on the line when the Cats and DAWGS play, regardless of the outcome of the Texas A&M game. I have always held that it takes about 4 games to get a reliable picture of a team, and we have 4 games to reflect on now. As of this moment, it looks like 10-2, but if this team continues to improve, 11-1, or even 12-0 cannot be taken off the table. The two losses at are Texas A&M and against Georgia. Georgia continues to be the strongest in the East, nearly on par with Alabama. The projected margin at Texas A&M this morning is about 1 ½ points due to their home field advantage, which keeps that game very much in play. 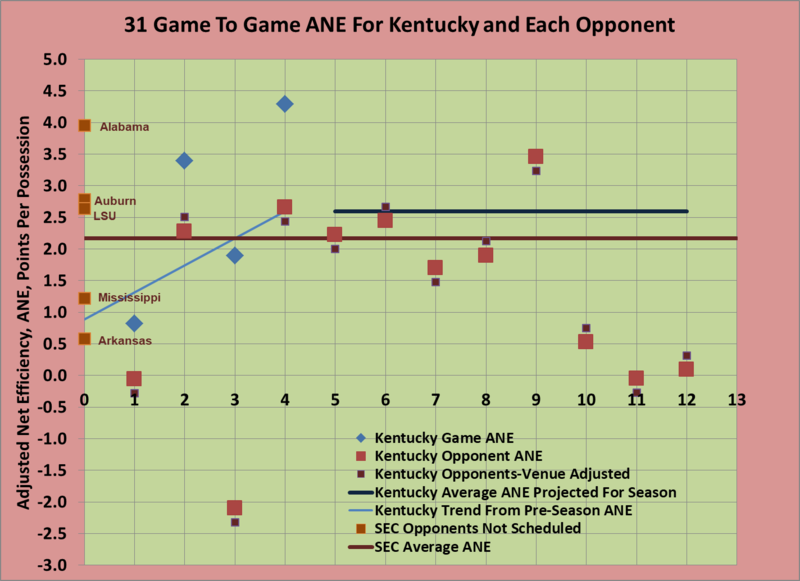 The following graph shows the ANE for each UK opponent (large red squares), adjusted for venue (small red squares), UK's game ANE for the first 4 games (large blue diamonds), and the UK trend line for ANE through the first 4 games, and extended (horizontally) for the next 8 games (no additional improvement assumed). Enjoy your sip from my Sunday morning fire hydrant! To Are Great Expectations for 2018 Justified?